The official website of Nanatsu no Taizai (The Seven Deadly Sins) announced a new television anime for the series on Wednesday. 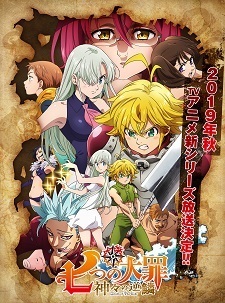 The new series, titled Nanatsu no Taizai: Kamigami no Gekirin (The Seven Deadly Sins: Wrath of the Gods), will begin airing in Fall 2019. New production staff for the television series have also been revealed. The new anime series will depict the fierce battle against the Ten Commandments, the fate of Meliodas and Elizabeth, the secrets of the world, and head towards the story's climax. Nanatsu no Taizai adapts Nakaba Suzuki's adventure fantasy manga of the same name, which has been serialized in Weekly Shounen Magazine since October 2012. Kodansha published the 35th volume on January 17, with the 36th volume planned for an April 17 release. The manga has over 30 million copies of its compiled volumes in circulation. Produced by A-1 Pictures, the first anime series aired in Fall 2014, followed by a four-episode television special titled Nanatsu no Taizai: Seisen no Shirushi in Summer 2016. Nanatsu no Taizai: Imashime no Fukkatsu, the second television anime season, premiered in Winter 2018. The Nanatsu no Taizai: Tenkuu no Torawarebito anime film opened in Japan last August. Netflix acquired exclusive streaming rights for the anime series and batch released all episodes of each broadcast installment after it had finished airing. Funimation licensed the anime for home video release and shipped first anime season in two Blu-ray and DVD volumes in May and June 2017. Kodansha Comics licensed the manga in English in 2013 and published the 31st volume on March 5. I wonder if this is timed to be the final season, or if there will be a fourth. The manga is ending soon. Can't it just end already? I mean its manga, not the anime. *Cries* Best Anime to ever exist is back, cant wait to see more of Ban and what unfolds next with Meliodas and the Ten Commandments. Also I wanna see Elizabeth true power as the Reincarnation of the Goddess !! I can't wait for this new series from the new studio for Nanatsu.. It's not like A1 animation was good in first place. Season 2 was an OVA. I even skipped it. Season two as listed by netflix or MAL because they are different things. Can't you see promo picture looks same as before? Nice , we didn't even have to wait so long . Studio DEEN? Why is everything changing studios lately? OPM, Konosuba and now Nanatsu. And it's always changing to a worse studio... Hm. OPM also kept most of the staff. Good news. I can't wait until that day. Anyone know if this studio change would affect the Netflix license? "A1's adaptations just felt too lifeless to me." totally agree with this. Fall2019 is getting an even better line up! Pretty great to have season 3 confirmed but DEEN? What's with the changes of studios recently? *Sees article* Please don't let it be Pierrot. *Sees Studio Deen* This might be the only worse choice. you know what? why isnt A1 again? because they are busy doing their job for SAO Alicization part 2 so it was a good choice to hand this project to another studio. i hope deen will make it better than season 2 was. cant wait to see Meliodas vs Escanor to be animated! I mean, that does make sense if you think about it. There's also the fact that there's not a single new anime being produced by A-1 Pictures for this Spring season. They're most likely focusing all their resources for Alicization Part 2.